Finally got on top of my Helix. Advice to noob modeller owners from another noob. I think I can justifiably say that I'm not normally a slouch with hi-tech gear, but I've been struggling to really nail the sound I wanted with my Helix LT. Too many options all at once, steep learning curve, real life intruding. Last weekend I finally got it together and I thought I'd share at the expense of looking a bit of a fool, because it was Max that fixed it. I have been using IRs with my Helix because of resource usage rather than for any dislike of the Helix cabs - although I couldn’t really get the sound I wanted out of those either. I like to have an AC30 =and= a JCM800 in my patches and there isn’t quite enough resource in the helix to get both native cabinet emulations loaded together with all my other favourite effects. Contrast: you can have a single IR block and switch cabinet IRs with a snapshot as you mute the amp you don't need. But the IRs I was using weren’t cutting mustard and I didn’t understand why. For me the difficulty had been in understanding how to mic up guitar cabs. No scrap that. My difficulty had been understanding, that with everything else going on in the patch, (virtually) miking up the cabinet was where I was going wrong. I don’t know how we got there but at some point towards the end of a long conversation that started with Max berating my guitar sound, I asked him ‘how would you go about getting a good sound in the real world’ and he said something like ‘I’d get a SM57 and I’d point it to the edge of the dust cap off axis and then I’d move it away from the speaker until I got the sound I wanted. Usually half and inch or so. Everyone does it that way’. Aha! Thought I. Surely amongst the vast array of free IRs I’ve acquired from the internet there must be one that fits that description. There were none. Neither were there any professing a R121 2” from cap edge. Or a U87 2” from cap edge. Or Sennheiser 4x1s 0.5' from cap edge. There =may= be several that were miked up in that way, but none had the metadata so I could find them. Or maybe they don't exist in (legal) free archives because these are the money, and no-one gives them away. Probably both. (I type that like I knew what a cap edge actually was and its significance in guitar cabinet recording before last weekend. I didn’t). At this point I decided to throw caution to the wind and actually fork out on a set of IRs. I’d heard that Shuffham - love the plugin - used Redwirez so I thought I'd try those first. I found a modern Marshall 1960, noticed that the component files were named exactly as Max specified, spent the princely sum of $9 and copied the appropriate ‘0.5” SM57 cap edge off axis’ file into my Helix. Bingo. In one. Even I could tell that it had worked. I sent Max a wav of a riff: ‘Spot on, I just needed to roll off a bit of low end. Should have bought the Orange cab though - they sound better'. Well you can't win them all! Anyway then I found this on the redwirez website https://www.redwirez.com/ir/DialingInYourTone.pdf. ‘I’ll just load all their recommended IRs and see how that goes’ I thought. Every IR mentioned here sounded as expected - as near as damn it like my beloved JMP1/GMajor/EL84 20-20 rig plugged into a 1960 cab with that mic: the Royer indeed had air; the 57 aggression; U87 was good but not me; do you think I could treat myself to a 421 for Christmas? … I could even hear through the sound to immediately realise I needed to pull back the mids on the amp model. Without denigrating any other suppliers, I think Redwirez are ace. If not for the IRs themselves then for the way they are filed/curated, making knowledge from the real world applicable in the virtual. My Helix is more than just an FX box with amp modelling: its nothing less than a virtual studio for guitars. I need to learn a lot more about how to engineer guitars to get the most out of it. Moreover I didn't have a concrete idea of what a good miked up guitar cab sounds like - which is ultimately why I was struggling. My previous modellers simply didn't have the options - the VG99 has some filters that vaguely sound like the mics in question (does one say SM57, yes - job done), my JMP1 has two balanced jack sockets with 'speaker emulation' proudly written on the casing (to be fair they work quite well in a mix). Go back any further and I was paying an engineer. Most of the people around here are sniggering having miked up thousands of guitar cabs - but if you are struggling and lack experience (I’ve spent the last year delving into HRM on my VG99, ultimately making a pretty convincing Vox Humana preset amongst other sounds) then $9 for some handy reference points on your fave cab to load into your AxeFX or Helix is astonishingly good value for money. And finally, thanks, Max! You are a star! Re: Finally got on top of my Helix. Advice to noob modeller owners from another noob. all good stuff - I know a couple of Helix owners and suspect that they'll find this fascinating and enlightening too. It's also a bit surreal. For £9, you are getting a great sounding cab in a good room with the right mic in the right place. That's peanuts. Even if you got 10 of them, that's still less than the cost of an afternoon setting up your gear for recording. We really do live in interesting times! C414; M160; TC30; RE20; PR30; KM84; M8; U87; U47; R121; MD409; MD421; MD441; SM7; SM57 and a TAB 57. All of which with most of the following positions: cap, cap edge, cap edge off axis, cap off axis, cone and cone edge. And at the following distances: 0, 0.5, 1, 2, 3, 4, 5, 6, 12 ins. For live use you just pick what your engineer would likely do which I guess means 0-1in Cap Edge or cap edge off axis for most dynamic mics and 2in cap edge for most capacitor or ribbon mics. * But if you're recording then you have a mic cupboard to die for and pretty much any position you fancy. I also bought the AC30 and Jazz Chorus 120 cab IRs because thats all of my fave cabs right there for $9+$8+$7. arkieboy wrote: I sent Max a wav of a riff: ‘Spot on, I just needed to roll off a bit of low end. Should have bought the Orange cab though - they sound better'. Well you can't win them all! arkieboy wrote: And finally, thanks, Max! You are a star! An absolute star and thoroughly decent gentleman. several other morals to the story. 1) to break the rules, or even stick to the rules, first you should learn the rules. 2) there's a vast plethora of emulations of things out there that just don't need to be emulated because no one ever makes real use of the real thing either, just because it's out there does not means it's useful. thus, get the right thing, in a limited number of options, and you're golden..... get a million things that you don't need and you'll never find the right solution. No, but I have worked as the sound guy at a gig where the guitarist from the headlining band brought his own Coles ribbon mic with him and asked me to use it, which, of course, I did. I've also worked a gig where the headliners brought their own sound guy, who brought two of his own ribbon mics along. It's not common, for sure, but it does happen. What I've found with my Helix, is that I get the best results by ignoring what the individual models are supposed to be of, and just experimenting and using my ears. I'm using mine mainly on for bass guitar - 5-string and Bass VIs - and running it into an FRFR powered speaker for live use. Most of my 5-string bass patches down even use amp or cab models (after all amps and cabs are just a way of getting your instrument loud with a baked in sound that you happen to like, and some controls that let you adjust to a degree that baked in sound), I just use one of the EQ modules. Where I have included an amp model it was one where I liked the drive effect and it has been used mostly for that rather than the overall sound. For the Bass VI I found the best amp for me was the one based on the Roland Jazz Chorus (not an amp that you would naturally associate with bass guitar). The great thing about the Helix is because all the modules are simply digital emulations on the devices they are based on you can't break them by running the wrong kind of instrument/frequencies into them. The worst that can happen is the result won't sound very good, in which case I move on and try something else. Studio Support Gnome wrote: just because it's out there does not means it's useful. No - don't tell me - I know the plot: you visit, we gas, you play and make me feel like a beginner. When you leave I suddenly notice all of the 2204 models have been replaced with Engl and the checksum on my 1960 IRs mysteriously match SM57 off axis files for Orange PPC412. i was away to buy a helix but decided to just get the hx effects...ive got a fender twin that i adore so i didnt need the amp sim part of it..
on a side note..i love this pedal...it the first guitar toy ive bought in years thats had me sitting in front of my amp night after night just doing things like "whats 6 delay pedals sound like"
Which Fender Twin model is it? And what is the footswitch actually switching for you? As an aside Gilmour rarely used just one drive pedal, even back in the early days with the Fuzz Faces so that might be why it isn't giving you "that" tone. Amp volume is also a big part of his tone, the amps are wound up loud to just on breakup. Odd that you are getting humm/buzz using the F/S - do you normally use a F/S with the Twin before getting the HX? its a 90's twin..i believe they get called the "evil twin"
my pal who has one has a marshal amp and it works fine on his setup..
i think it might have to do with fender footswitches..my fender footswitch has lights on it so i assmue there is a voltage coming from the footswitch port to the actual switch..maybe the hx isnt expecting that ??? do you think i need to get something like a insert lead and use both expression ports to get this to work properly..
Hewesy wrote: As an aside Gilmour rarely used just one drive pedal, even back in the early days with the Fuzz Faces so that might be why it isn't giving you "that" tone. Amp volume is also a big part of his tone, the amps are wound up loud to just on breakup. 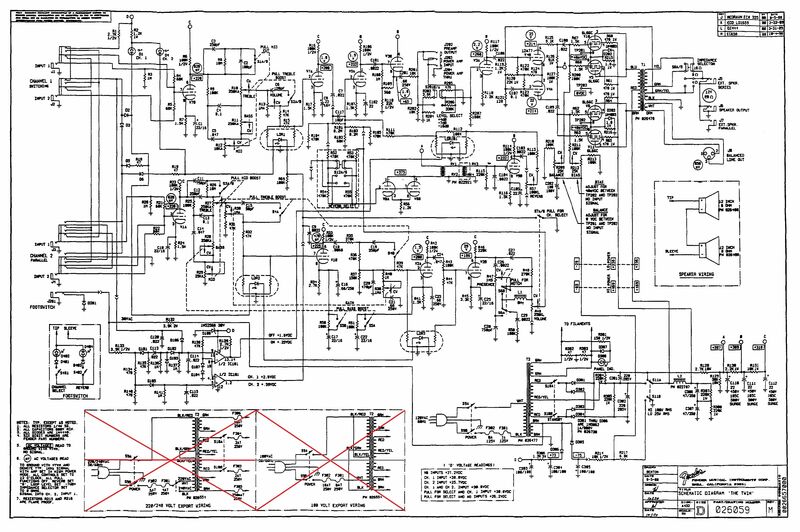 Here's the best schematic that I could find of 'The Twin' , Foot-switch digram is bottom left and yes, there are diodes involved. You could probably make up an in-line box containing a diode which would allow you to switch channels. With your pedals I doubt if you want to use the on-board reverb, so you won't need the other diode or switching contact. I can't read the diode type clearly, looks like 1N4440. Maybe someone else could confirm whether that's a likely candidate. Otherwise maybe 1N4448. The switch is switching 30v AC (though there will be some drop across the diode and LED), so you need to make sure that the voltage rating of the relay in your switching unit is sufficient.